Unlike the New York Yankees or the Boston Red Sox, the major league baseball team of America’s capital city Washington, DC has no stadium of its own. Starting in 2008, the Nationals’ $611 million (about Rs2,400 crore) stadium will sit on the Anacostia river with views of the US Capitol—the symbolic home of Congress. This wasn’t the first time Gandhi has given that answer. In the US capital, he is known as ‘Dr No’. The nickname coined by the local magazine, Washingtonian, has stuck as he consistently refuses to spend outside the city’s budget. His goal: keep DC away from the bankruptcy of the mid-1990s. Gandhi holds the purse strings to the US political capital. Keeping fiscal discipline around approximately $9 billion in annual operating and capital funds is a challenge in any city, but DC is different. The city is like a business that cannot collect money from most of itscustomers. DC provides services comparable to a state at roughly $4 billion annually, but cannot collect taxesfrom more than half of its workforce and almost half of its real estate owners. As Gandhi says, “the city is not a viable proposition." According to the most recent US census in 2000, every day approximately 400,000 commuters (78% of the DC workforce) pour into the city from the neighboring states of Maryland and Virginia. They use the city’s roads, parks, bridges, technology and libraries, but go home and pay taxes in their own states. “The bottom line is that two-thirds of the income that is generated in this city is not taxed in this city," says Gandhi. “It is like saying that you go to a restaurant and one-third people pay, two-thirds people do not pay, and then everybody complains about bad food and bad service." It is an example he has given repeatedly to press and constituents as he explains the city’s predicament and his accomplishments in a concise 10-page presentation. On top of the commuter straitjacket, the 10 largest private employers also don’t pay tax. Roughly 42% of the real property values are tax exempt, he says. This includes the White House, the Capitol, Georgetown University, about 375 consulates, and the World Bank. “This is an anomaly," he says. “Nowhere else in America, this could happen." Other cities in the country, such as Detroit, Philadelphia, New York, Atlanta or St Louis get funds from the richer suburbs to support the heavy needs of the city through the state government. Gandhi took on these seemingly impossible constraints and turned them around over the last decade with old-fashioned discipline and fortitude. He is considered by many to be the most powerful man in the DC city government. This month, Washingtonian named him to its Power 150 list and he is one of the members of Governing magazine’s US Public Officials of the Year for 2007. When the city’s young mayor, Adrian Fenty, was elected in 2006, Gandhi was the first person he publicly announced as staying on board. Since Gandhi came into the city office, he has re-engineered the tax system so citizens get refunds in 14 days or less, sued the World Bank to broaden the tax base and solidified the end of the city’s bond rating as part of the “junk" pile. But, most of all, since he took over the department in 1997 and became CFO in 2000, he brought the city to a surplus of $1.6 billion. Gandhi imposes the discipline he uses on the city on himself as well. He wakes up at 3.30 am and religiously reads The Washington Post, The Washington Times, The Washington Examiner, The New York Times and The Wall Street Journal on the Internet. “The rule is that you open the metro section first thing in the morning and if your name is not there, it is a good day," he says. He answers emails, writes poetry, goes to the gym and has a breakfast meeting with someone—all before he gets to work at 9am. Gandhi’s Gujarati poems have ended up in two published books, which he seems to be more proud of than the city surplus. He gets home between 6.30pm and 8pm, and sleeps by 9.30pm. “I don’t know who Jay Leno is," he quips, referring to famous night-time television talk show host who usually airs around 11pm. Gandhi’s steadfastness started young. In 1957, at the age of 17, he had come to Mumbai from Savarkundla, Gujarat, with hopes of making a fortune. He often tells Americans that he is from the same place as the Mahatma Gandhi. “We speak the same language. Same name. Except that he became the Mahatma and I became an accountant," he says. Adds Gandhi who fell in love with works of Emily Dickinson, Robert Frost and Wallace Stevens: “In my younger days, I used to do some poetry, but then I discovered that if I want to eat and keep proper house, I should turn to accounting." When he was a student of the University of Bombay (now called Mumbai University), from which he got a law degree in 1964, he longed to study in the US partly due to his love of American literature, but had no means to pay. He spent relentless hours at the American and British libraries applying to universities until he got a scholarship to Atlanta University (now called Clark Atlanta University) in the southern state of Georgia. But he didn’t even have enough money for the flight. “Those were the golden days of American universities," he says. The school also gave him the money to travel and he says he went there in 1965 with all but $7. At Atlanta, he got his master’s in business administration, and later received a doctorate in accounting from the Louisiana State University. After teaching at a predominantly African-American college, North Carolina A&T, in 1966 during the civil rights movement, he spent 1973 to 1998 mostly teaching at major universities including the University of Pittsburgh’s Graduate School of Business, and the MBA programmes at American University, Georgetown University and the University of Maryland. 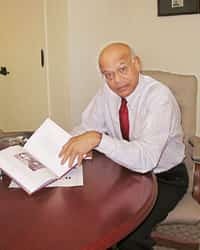 In between, he did an internship at the government agency, General Accounting Office in 1976, and assisted the New Jersey governor on changes to the pension system in 1991. In 1997, he was brought into the DC city government to lead the collection of $4 billion in taxes, where he started his legacy. When he walked into DC administration, it had a deficit of around $300 million and a shrinking tax base, and he found 2.6 million tax returns stuffed into a room. “In those days if you paid our taxes, we’d say thank you, if you didn’t, we’d say thank you also," he says without a smile or pause. It is hard to tell when he is being serious and when he is joking. This time though, he pulls out pictures of a room almost filed to the ceiling with tax files. After seeing the room, Gandhi says he fired every manager. Then, he set goals for the staff of the city’s Office of Tax and Revenue. Previously, tax returns were done in about two months, but Gandhi announced publicly to The Washington Post and on television that the returns would be done in two weeks—and said he would bring cameras into the office, if needed. Then, he took the team on a road trip to the Philadelphia Internal Revenue Service centre, the body that collects America’s national taxes. “If Maryland can do that, if Virginia can do that, why can’t we do it," he says. “And, sure enough, they rose to the challenge and performed." During this time, Anthony Williams, who started the financial improvements for the city as the first CFO of DC, was watching Gandhi after having brought him in as OTR head. But, when Williams became mayor in 1999 and wanted Gandhi—who he calls Nat—to succeed him as CFO, he knew that idea would be harder to sell. Williams took Gandhi to DC’s Old Ebbitt Grill, which has served many US presidents, to make his argument. “He was sceptical about how an Asian immigrant would be received," Williams says. “He was sceptical because, like me, he is kind of an odd ball, ya know. He was certainly sceptical of the enormous challenge. I convinced him." And, Gandhi took to the role quickly. His office used to be in a building in an area called Judiciary Square (his current office is on Pennsylvania Avenue, an address he shares with the White House), and he would look out from the 11th floor to views of museums and monuments. “But nothing I could tax," he says. But the view gave him ideas to broaden the weak tax base in the city. Although the World Bank was a tax-exempt institution, its cafeteria vendors shouldn’t be exempt, Gandhi thought. So, he took legal action and won. He would love to go after the world-renowned education and research institution, the Smithsonian, which has a profitable gift store, magazine, and travel agency that are all exempt by association. But his lawyers tell him he would never win. Former mayor Williams notes that Gandhi is both an accountant and a writer. “He has both sides (of his brain) working," says Williams. And, for a big guy like Nat, that is a lot of brain power." Meanwhile, Gandhi says there is still a long way to go for the city. “If there is a flood in the basement and the roof needs to be fixed, we have no money for that," he says. “Our schools, for example, on average are about 65 years old. We have the resources of a city, but we have to provide the needs of a state. Because we are a state, city, council, municipality, a school district all combined." His next initiative for DC is to go to the next level of fiscal discipline. He says “it is not enough to spend money, but to say what do you get out of the money." He wants to measure productivity and benchmark against other projects in other cities. “If you are paving one mile of streets how much does it cost here, how much does it cost elsewhere?" he asks. “So far, all we say is we spend money." The city has spent $30 million on expanding its health-care alliance and Gandhi says he will measure the output. Gandhi is quite modest about the attention—and fame—he gets in the city. “I take one day at a time," he says. “In this town you are a hero today and gone tomorrow."